Israel's Deputy Foreign Minister met with India's Foreign Minister and praised her for her stance to Israel's fight against terrorism. 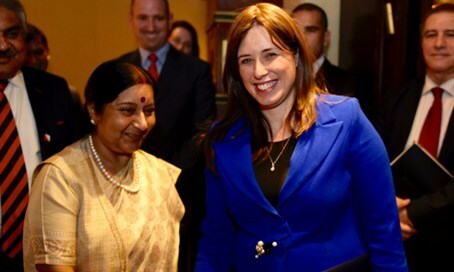 Deputy Foreign Minister Tzipi Hotovely met Monday afternoon with India’s Foreign Minister, Sushma Swaraj. The meeting was held in a pleasant atmosphere against the backdrop of rapprochement between the two countries. At the opening session, Hotovely expressed her appreciation for India’s stance alongside Israel in the war against Islamic terror. She thanked the minister for her public condemnation of recent terrorist attacks. During the meeting, the two ministers discussed the expansion of their bilateral cooperation regarding student exchange programs, development in water systems, and agriculture. "In the last 24 hours we have witnessed horrific cases where women have been attacked at the door of their home, and unfortunately, one case ended in a brutal murder,” said Hotovely to Swaraj. “I appreciate your condemnation of this tragic murder. Terrorism is not only a problem in Israel, there is a global problem of Islamic terrorism and in this context we see India joining in the fight against terrorism."